Pictured from left are JP Davis, TR Edwards, and Brett Wilt with the new weather sensor installed at River Valley High School. 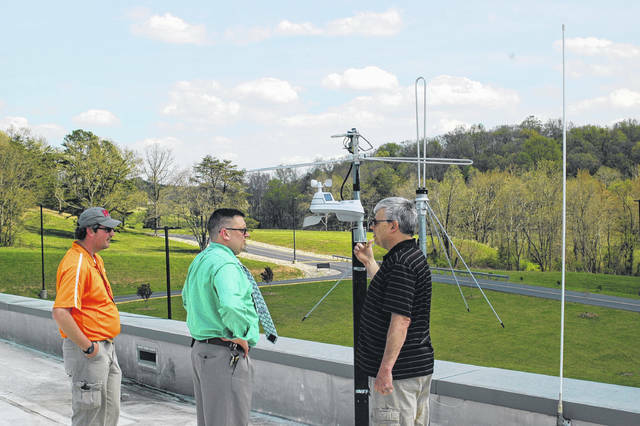 GALLIA COUNTY — Local residents of Gallia County will be getting more accurate weather forecasts and observations thanks to an increase in weather stations in the region. In particular, two stations have been installed at River Valley and South Gallia high schools. Brett Wilt was asked by JP Davis to help set up weather data collection stations at both schools for students to use in class. Wilt, who works for IBM on weather computer models, has been working to fill a void of data collection in southeast Ohio. “The goal here was, there are not a lot of weather sensors here in Southeast Ohio, especially since there are no National Weather Service Stations. Because you have that void area you have difficulty forecasting and data going back to computer models so this is a relatively inexpensive way to help fill that void,” said Wilt. Currently there are approximately 10 to 15 sensors in Gallia County which send data to Wilt and others like him to help improve weather forecasting. The sensors installed at the schools collect data on several main items: temperature, dew point, relative humidity, barometric pressure, rainfall amounts, wind direction and wind speed. “I do a lot of forecasting locally, I have a Facebook feed so this helps me out but it also helps the schools out with some education and building experience as well,” said Wilt. The program and equipment was funded through a grant by American Electric Power called the AEP Teacher Vision Grant, which provided $500. The observed weather data can be accessed publicly through the Weather Underground App by configuring the settings to pull data from the nearest sensor.